Star Trek 3-Dimensional Chess Set - Moar Stuff - You don't need it but you know you want it. The Official Original 1994 Star Trek Tri-Dimensional Chess Set! 24kt Gold and Sterling Silver Plated Chess Pieces! 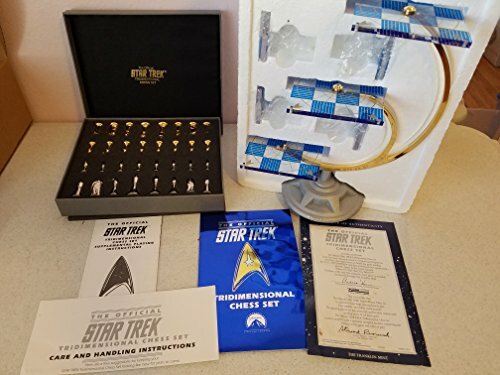 Includes Certificate of Authenticity, Custom Tri-Dimensional Chess Rules and Strategy Booklet, Photo of Captain Kirk and Mr. Spock Playing Tri-Dimensional Chess and Custom Foam Packaging to Preserve this Beautiful Work of Art! Crafted of Three Larger 4.25 inch Playing Boards plus Four Smaller 2.13 inch "Moveable Attack Boards"! I still remember the first time I saw a 3-Dimensional Chess Set on Star Trek. It was the pilot episode (OK, technically, the 2nd pilot episode “Where No Man Has Gone Before”) and little did I know that it would become an iconic piece of Sci-Fi history. This chess set is one of the original 1994 Franklin Mint versions so it’s not a cheap knock-off. Since it wasn’t produced for the mass-market, there was only a single, extremely limited production run. 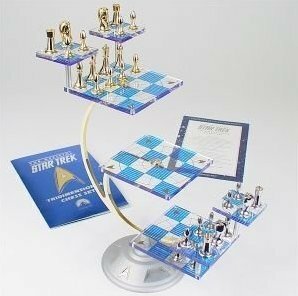 That puts this Star Trek 3-Dimensional Chess Set in high demand by collectors. The approximate height of assembled chess set is 14 inches and it features the original 24kt gold and sterling silver plated chess pieces. This was made by the Franklin Mint, after all. This set was never produced for retail sales, but rather was a direct mail order only. Consequently, it was not produced with any retail packaging. The Styrofoam insert was placed directly into a shipping box. So, don’t expect any fancy packaging with this collectible to display on your shelf. This is one you can actually take out of the box and play with. Just do it very carefully and don’t lose the Styrofoam insert. Now, I’ll open with the, Kriskov Gambit… It’s your move. Dimensions: 13.5 x 11 x 8 inches. 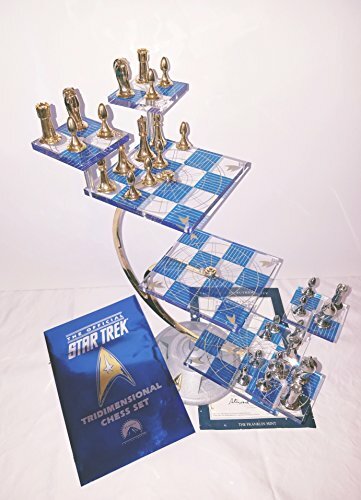 Includes certificate of authenticity, custom 3-dimensional chess rules and strategy booklet, photo of Captain Kirk and Mr. Spock playing 3-dimensional chess and custom foam packaging to preserve this beautiful Work of art! Designed with three 4.25 inch playing boards plus four 2.13 inch “Movable Attack Boards”.